The WickedHD 7 Inch Rotating Color TFT LCD display works perfectly with Car DVD, Rear View Camera, VCD, camera, STB, satellite receiver, and other video equipment. It can also be used as a monitor for FPV/CCTV system/rear view camera. High Resolution: The WickedHD 7 Inch Rotating LCD display has a Color TFT LCD display and a resolution of 800 x 480 pixels. Easy to use and operate; Comes with an IR remote controller for a easy operation. Adjustable to your needs; 2 ways to install: standing or mounting. Supports screen rotation and adjustable brightness, contrast, and color. 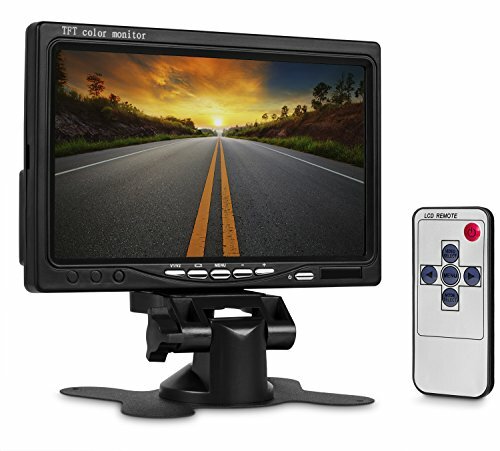 High quality Guaranteed; This LCD display monitor is backed by WickedHD's 1 Year Warranty. If you have any questions about this product by WickedHD, contact us by completing and submitting the form below. If you are looking for a specif part number, please include it with your message.